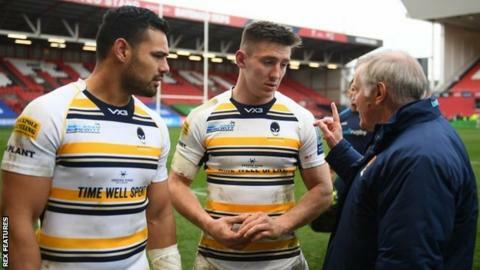 Worcester's Wales international winger Josh Adams says it was not an easy decision to join Cardiff Blues and that he did think about staying at Sixways. But knowing that, under Wales Rugby Union selection rules, staying at Worcester would mean losing his Welsh place was the chief determining factor. Only Welsh players with 60 caps or more are currently considered if they play outside Wales. "The move back to Wales was something I had to make a decision on," said Adams. "With the 60-cap policy, if I did want to carry on representing my country then I would have to make the move back across the bridge. "People might think it was an easy decision to just carry on playing for Wales, but considering what Worcester have given me in the past four seasons and how well they have looked after me it did take some thought. "But it was always my dream to play for Wales. I got a taste of that last season in the Six Nations then went on the summer tour with the Tests against Argentina. "The autumn was brilliant too. It was a great experience to play top-tier nations from the southern hemisphere like Australia and South Africa and to beat them was amazing. "Then to top five games in the Six Nations off with a Grand Slam was incredible. I didn't think I would be standing here as a Grand Slam champion this time last year. "And everybody now has the goal of getting in those Rugby World Cup 31-man squads for Japan." Swansea-born former Scarlets academy player junior Adams, 23, has made his move back to Wales amid unrest about the plan to make changes to the current domestic rugby set-up in Wales from the 2020-21 season, dubbed Project Reset. The changes could see an end to dual contracts - funded jointly by the WRU and the regions - and introduce pay banding for players. And 11-times capped Adams admits that, if the rules on international selection were different, he might well have stayed in the Midlands. "I definitely would have considered a lot more," he said. "That would have probably been option one. "I can't say for definite that I would have stayed, but I am settled here, happy with the environment, the coaches are great to me and I've made some great friends. "I want to leave Worcester in the best possible place at the end of the season. I'll put 110% into everything I do." While vowing to give his best towards the cause of keeping Worcester in the Premiership, he also does not rule out a return to Sixways later on in his career. "It's hard to say because I don't know how things are going to unfold over the coming years," he said. "But it would be nice to make a return at some point. "Towards the end, it would be lovely to come back and play at Sixways again. We'll see about that when the time comes."